If a TV show in any way deals with Catholicism, there’s sure to be some time given to the exploration of guilt. It’s a theme built into religion, and is a convenient (but not necessarily simple) way to complicate a show’s moral outlook. It’s evident in Daredevil, Ray Donovan, and even in Preacher, where it sits among the exaggerated genre tropes. 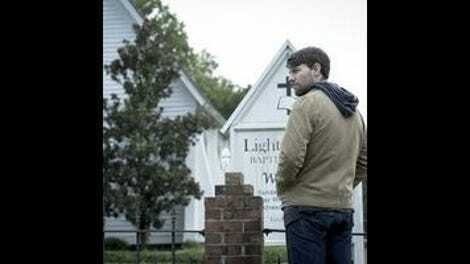 Outcast isn’t exactly heavy on the religion, but it is interested in guilt, alongside all the hellfire and brimstone. Where the series premiere offered up an immediate look at the type of world the small town of Rome is situated within, one where demons and possessions aren’t so farfetched, “(I Remember) When She Loved Me” takes a little more time establishing the smaller details, giving life to Rome and the people that populate the town. Much like the premiere, “(I Remember) When She Loved Me” boasts a storytelling style that’s all about delivering bits and pieces of information that, over time, slowly reveal a whole. Thus, certain objects and people are offered up, taken away, and then given context later. There’s a bloody tooth underneath a cabinet in Kyle Barnes’ kitchen, a bag with a bloody dead animal in it, and a mysterious man lingering at the church and outside Kyle’s house. These things are focal points in their respective scenes, and it establishes their importance while the lack of context contributes to a steady feeling of impending doom, a tone that’s integral to Outcast’s success so far. So, the tooth is focused on in a close up in Kyle’s hand; the camera is tight on the bloody, leaking bag that a local carries to the police station; and that mysterious man comes into focus in the frame just as Reverend Anderson utters the words “dark forces.” A little on the nose? Sure. Entirely effective? Absolutely. So while “(I Remember) When She Loved Me” doesn’t have the same immediacy as the first episode—there’s hardly a demonic possession in sight—the visceral nature isn’t lost. That’s an important statement for the show to make. 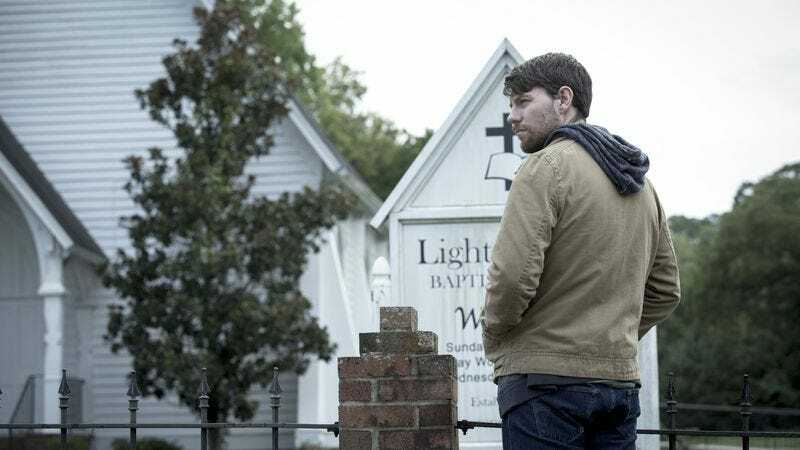 Outcast could easily coast on jump scares and creepy visuals, but the second episode of the season suggests that the heebie jeebies come from a deeper place. In essence, the show is more interested in using the jump scares—Kyle’s mother bursting out from the pantry during a flashback is the best of the bunch here—to accentuate the dread that permeates this town. There’s violence and tension everywhere. It’s evident in Reverend Anderson’s stirring opening sermon, which is pure hellfire and brimstone and adds a nice bit of texture to his character and his congregation. It’s evident in the way the Chief doesn’t blink an eye when he comes upon gutted raccoons and squirrels nailed to trees in the forest. But, back to guilt. It’s a running theme in “(I Remember) When She Loved Me,” as Joshua’s exorcism has Kyle feeling conflicted about his mother. Reverend Anderson assures him that the demon is gone, that Kyle did what he had to do to help his mother be free of the evil. And yet, Kyle can’t escape the fact that his mother lies in a nursing home, barely eating, barely breathing, barely alive. She wasn’t like Joshua; she didn’t recover from the demon. Kyle’s relationship with his mother (the current, non-demon version) works as commentary on assisted suicide, with Kyle reckoning with the idea that his mother might have been better off dying than living in her current state, but it’s even better as a way to complicate Kyle’s character and his decisions going forward as a demon fighting sidekick to Reverend Anderson. The premiere gave us the idea that certain demons may be following Kyle Barnes, somehow intertwined with his life, but held back on any personal details. “(I Remember) When She Loved Me” begins to fill in the gaps. Through flashback we get to see his mother in the moment she became possessed, something snapping inside of her as she falls to the ground and manically begins to rub mud all over herself. It’s a stirring cold open that nearly matches the one from the premiere, and once again solidifies that this show understands how to do creepy right. On top of that, Megan going to Kyle’s daughter’s seventh birthday party also fills in a few more details. Namely that Kyle’s wife, Allison, seems to be perfectly fine, a bit of a reveal considering we last saw her in a flashback with her eyes rolling into the back of her head and blood running out of her nose. All of this is to say that “(I Remember) When She Loved Me” confirms that the kind of storytelling that made the premiere so compelling, elusive, and frightening wasn’t a happy accident. Outcast is showing that its horror lies in the personal, in the unseen, in the yet to be understood. The show isn’t rushing to answer any questions, instead taking its time in establishing themes, images, character, and tone. So, when that mysterious man from the church pops up at the end of the episode, telling Kyle’s mother that “despite everything, we have him anyway,” and a tear rolls down her face, we may not really know what he’s talking about but it doesn’t make the moment any less chilling. The show’s commitment to fleshing out its characters and tone allow for that moment to hit home so effectively. That’s integral to Outcast moving beyond its genre elements and crafting something deeply affecting and off-putting week after week. When the camera focused on that mysterious man in the church and it turned out to be Brent Spiner, I nearly jumped out of my chair with joy. In fact, this show is collecting quite a few great character actors. Grace Zabriskie makes an appearance here, as does Melinda McGraw, aka. Scully’s sister on The X-Files. The tree consuming the bike in Kyle’s front yard was a nice visual touch. Outcast’s balance of tone also includes a bit of humor. I couldn’t help but chuckle at Patricia and the Reverend’s flirty innuendoes involving pie and temptation.